The Portwest Orange Latex Grip Gloves A150OR are latex palm-coated gloves which provide excellent grip and protection without limiting dexterity or flexibility. Ideal for building applications, these breathable gloves ensure you stay cool and comfortable throughout the seasons. The Portwest Orange Latex Grip Gloves are designated Category II gloves, meaning they are designed for medium-duty applications and intermediate levels of risk. 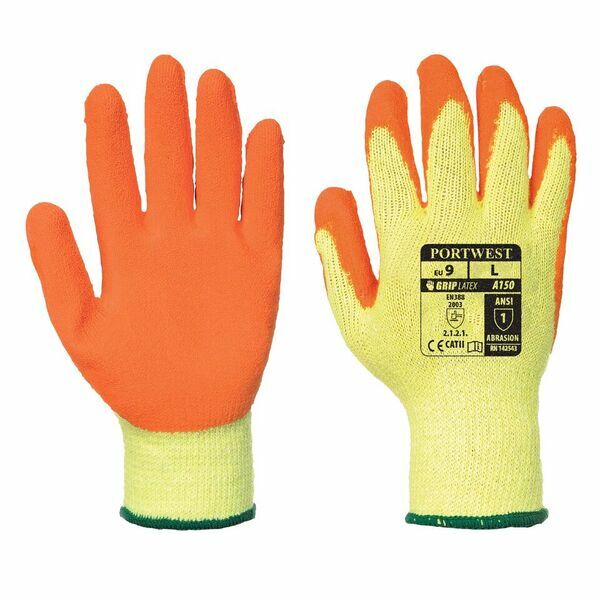 The Portwest Orange Latex Grip Work Gloves are available in five different sizes. Please measure the circumference of your hand around the knuckles (excluding the thumb) with your hand open and your fingers together, and the length of your hand from the tip of your middle finger to your wrist.